NEW YORK, NY (JUNE 18, 2018)– Researchers at Columbia University Irving Medical Center (CUIMC) have developed a highly innovative computational framework that can support personalized cancer treatment by matching individual tumors with the drugs or drug combinations that are most likely to kill them. In a comprehensive analysis of samples from 212 patients, the team first identified a new class of drug-targets, called master regulators, which are rarely if ever mutated in cancer patients, and then predicted the drugs that can specifically invert their activity. Surprisingly, even though tumors were analyzed on an individual patient basis, the algorithm predicted the same top drug – Entinostat – for almost half of the metastatic patients. More importantly, when tested in a xenograft transplant of the tumor in a mouse, this drug induced dramatic shrinking of the tumor, while drugs predicted to have partial or no effect were also validated to produce results in line with predictions. These data led to rapid IND (Investigational New Drug) approval by the FDA for a metastatic GEP-NET clinical trial that is open and recruiting patients at Columbia University. The OncoTreat framework centers on identifying and analyzing actionable proteins in cancer patients, independent of their genetic mutations. Called master regulators (MR), these proteins are organized into small regulatory modules – so-called tumor checkpoints – which are responsible for regulating and ensuring the stability of tumor cells. 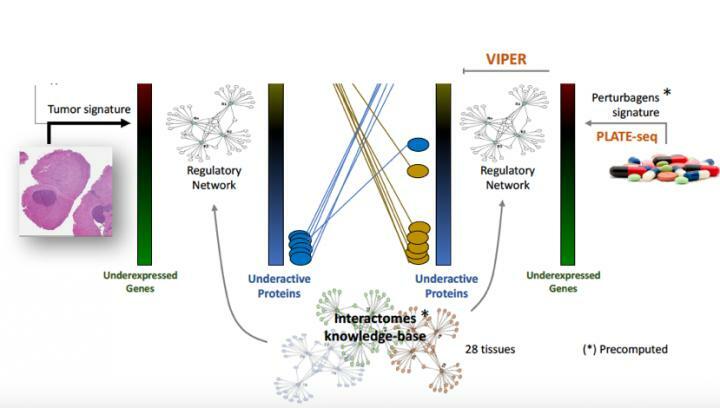 Master regulators and tumor checkpoints can be efficiently and systematically elucidated using the VIPER algorithm developed by the Califano Lab and published in an earlier Nature Genetics manuscript; critically, these analyses allow tracking their activity through metastatic progression, relapse, and development of drug resistance. These computational models were built based on mathematical concepts from information theory and Bayesian statistics and have been extensively validated over the past decade. "Master regulators–a new Achilles' heel of cancer–represent the engine room of the cancer cell, where the effects of all tumorigenic mutations come together. What OncoTreat is able to do is attack this convergence point with a therapeutic intervention," says collaborator Gary Schwartz, MD, division chief of hematology and oncology at CUIMC and associate director of the Herbert Irving Comprehensive Cancer Center. "By collapsing this tumor bottleneck, blocking this Achilles' heel, the cancer can no longer survive. This method is so innovative, requiring a lot of mathematical modeling and understanding. It's a whole new approach to cancer therapeutics, taking us in an entirely new direction."